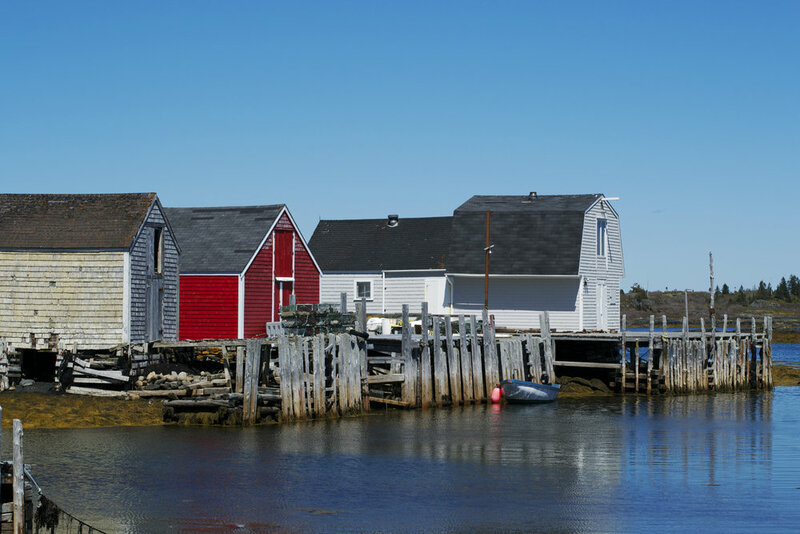 Blue Rocks, just a stone's throw away from Lunenberg, is a serene fishing village tucked away from the world. 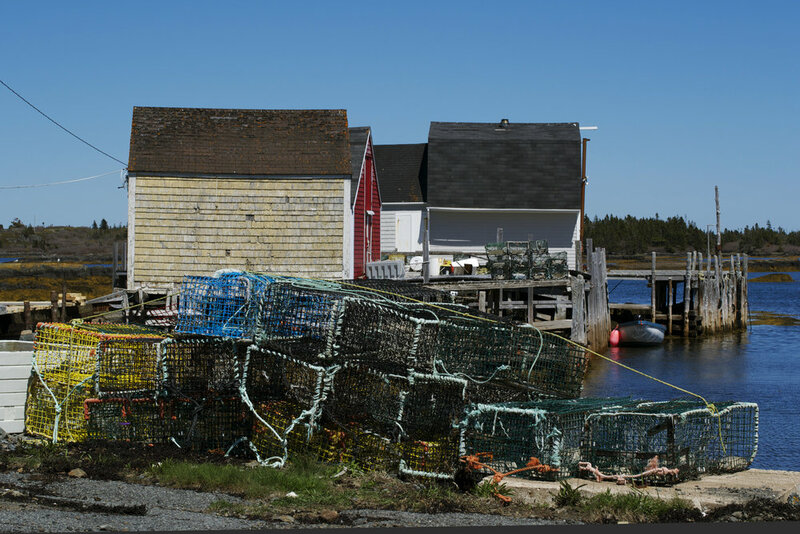 Fishermen & residents are just doing their thing, seemingly unaware of the spectacular haven they are working and living in. Although, when you look closer, you can see in their knowing nods, half smiles & waves (that they give a passersby like me, driving with her mouth agape in awe of this hidden jewel) that they are well aware of this place they call home is a gem. So, perhaps... just maybe... they are just keeping very hush about it all. Sun-glistened golden seaweed adorns the rugged blue rocks here, sparkling brightly letting you know you are somewhere very special. I think that when one has time to decorate a shed into a piece of living art, life is good. This crazy garden shed had me stop dead in my tracks. I LOLed with pure joy the first time I laid eyes on it. What fun the owner must have watching people stop and take it in ~ brightening everyone's day! You have to be hardy to live on the edge of the world and these aged beauties are here to say, they made it through season after season against the elements. There's something proud about that and these weathered buildings have stood the test of time and will charm you with their character. Hikers, bikers and kayakers delight in exploring this area. It is Mother Nature's Wonderland! 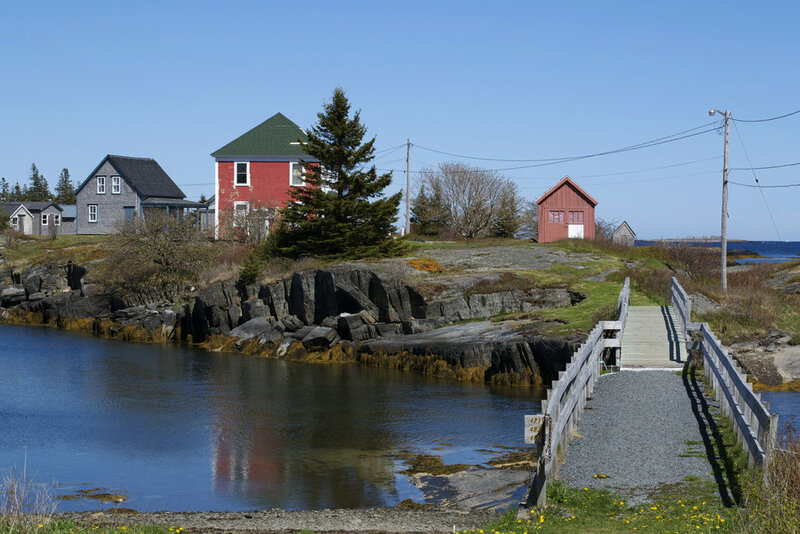 Whether you boat, hike, bike, walk or drive - don't miss the inner rivers and inlets too. By car, be sure to wander the side roads (often lumpy, bumpy single lanes and one car bridges) to see what film-makers have discovered deep within this community. There's no denying, this is a magical secret place. I was going to 'name drop' which film and TV actors have fallen in love with the area after working here, but I won't. However, you can be safe knowing that you will be in very good company, if you think this little community is a charmer. Perhaps, like many of them, you should buy a little land here for an escape to 'get away from it all.' No one will ever find you here... or will they? 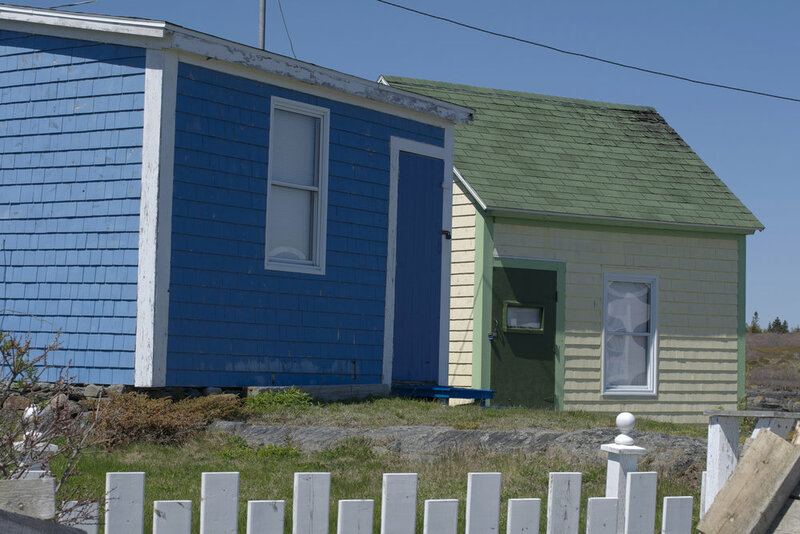 The thing is ... you never know who your neighbour might turn out to be when you settle in Blue Rocks. Scattered boat relics lie on the shores of Blue Rocks like landmark memorials. I think not only do these abandoned boats bring joy to those fishermen that know their history but they also bring a smile to those like me, that wonder and imagine what adventures were had aboard these wooden vessels. These beauties could tell some tales I'm sure. 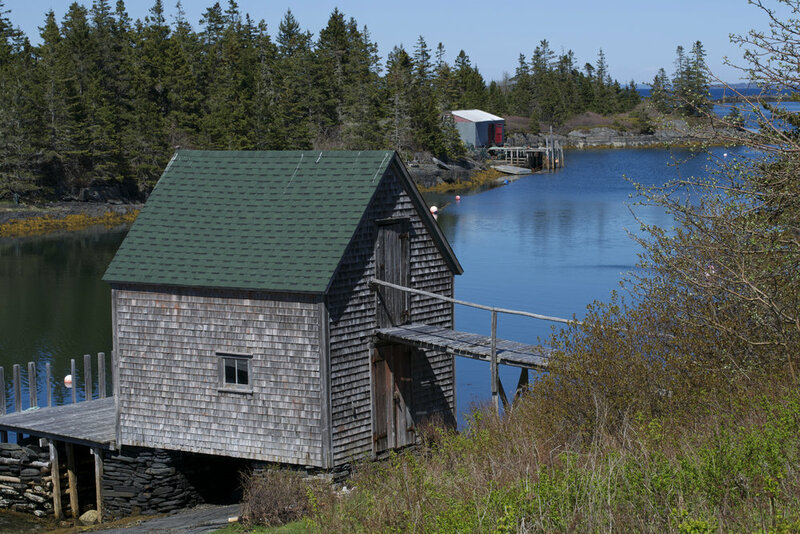 This picturesque little fishing shed is a popular subject of artists & photographers alike. 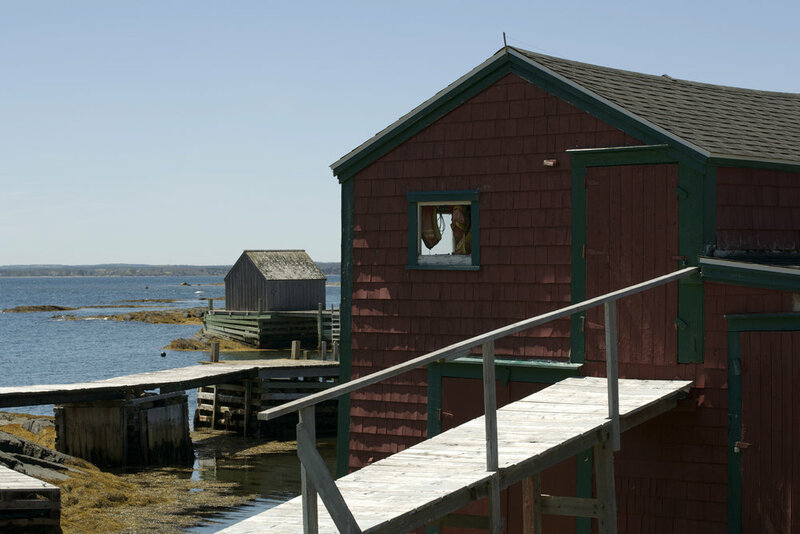 It is depicted in many paintings in nearby Lunenberg Art Galleries and it draws people out of their cars with their cameras to try to capture its essence. 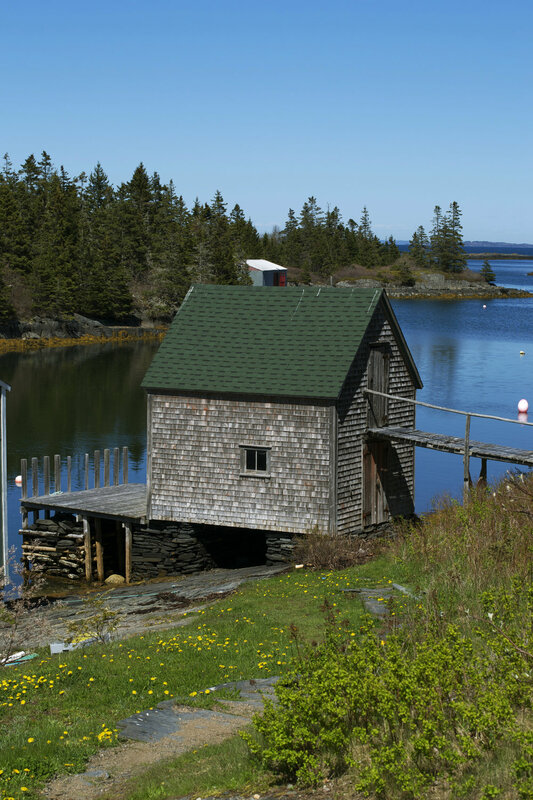 It is said to be the most photographed fishing shed in the county. Blue Rocks is a muse for creative minds. Writers weave extraordinary, imaginative stories around it and artists & photographers are inspired by this windswept wonderland and find it hard to tear themselves away. Be sure to stop to see Robert Danielis and his FolkWorks Studio Gallery when visiting Blue Rocks. He is a quirky folk art sculptor with a zany sense of humour. 'Not the Usual Unusual' he says. You can see his work on display throughout Blue Rocks. This mermaid sculpture was a standout on this pretty turquoise home. Another mermaid greets you at 17 The Lane where Robert lives and works. He can often be found carving his latest project in his workshop at the end of his driveway. Go right in as he welcomes visitors & he is more than happy to show you his art studio full of fun folk art pieces. When you live on the edge of the ocean, you know and respect its mighty strength and everlasting beauty. People here live modestly & are with one with nature. It can been seen in their weathered faces, strong arms and wise eyes. I think they know secrets about life that the rest of us may end up spending the rest of our lives trying to figure out. Drive slowly, open the car windows and breath in that salty air. Respect the locals. They make this their home and kindly share it with you. Savour the spectacular views and enjoy being in on this secret haven. This is one of the most beautiful places you will ever see. 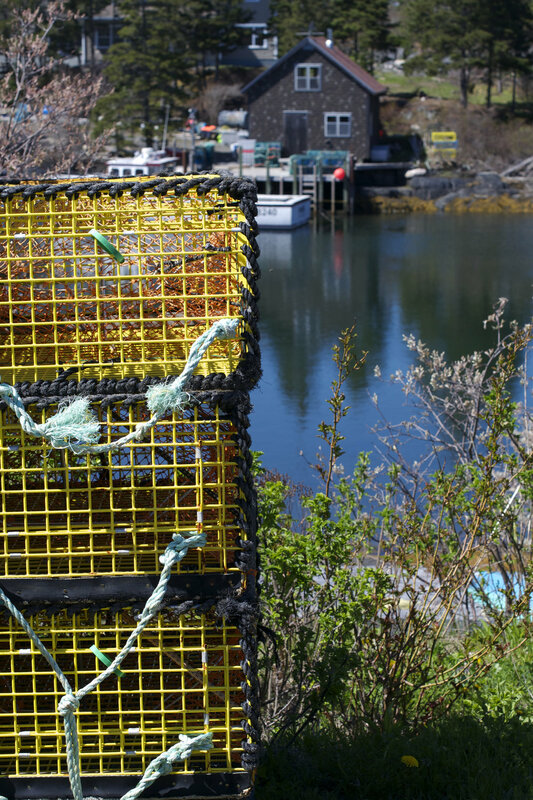 Blue Rocks IS Nova Scotia!